Pretty gold tone necklace made by Sarah Coventry. 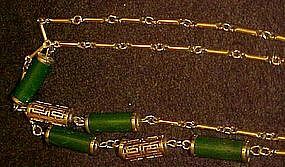 Faux jade beads alternating with gold barrel beads of oriental patterns. Sarah Cov. tag. Hangs 16 1/2" long. Excellent condition, shiny and bright.